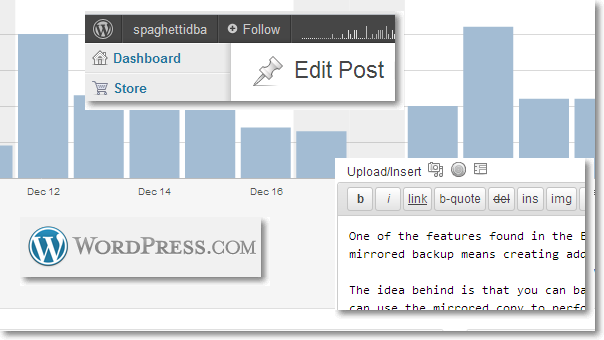 ← Mirrored Backups: a useful feature? Posted on January 3, 2012, in Blogging and tagged blogger, blogging, spaghetti, SQL Server. Bookmark the permalink. 6 Comments. I agree… done correctly, blogging is very much like writing technical articles. Doing two of those a month can certainly be a chore. Of course, short “spackle” subjects take less time but only because there’s less code to prove. There’s nothing wrong with short blogs that bring a single point home. And writing about something that’s already been “covered in thousand of articles and blogs” isn’t so bad especially if you can add clarity or simplicity to a subject. Congratulations on the “First Year” and keep up the great work! Maybe it’s an obsession of mine, but I don’t like writing about something that can be found somewhere else. I like the idea of writing something “unique”. There are so many oustanding articles on almost every possible SQL Server topic that I don’t think I can add some value to them, especially when compared to the “superstar” authors. Always, I found very nice stuff from your posts! Keep doing a great job blogging! All the best and more success, next…! Thank you, Dugi, you’re very kind. An excellent first year, Gianluca! I hope I will not disappoint the expectations (if any…).